Published on March 23, 2009 in Beer Culture and Homebrew. 0 Comments Tags: fermentation friday. Byron at homebrewbeer.net poses this month’s Fermentation Friday topic. I’ve been a little busy the last w months with a new baby, but that dovetails nicely with my change. 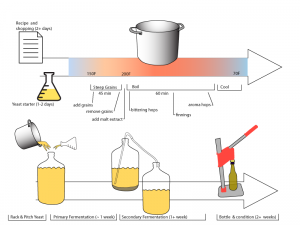 I’m working on setting up a tiered brewing system that utilizes gravity’s sweet love to move water from the hot liquor tank in to the mash tun, and that same gravity to lauter the sweet wort in to the brew kettle. Sure, there’s the initial investment of time to build the setup, but then I’ll be able to step away from the lauter with a little more confidence to interact with the kinders during the lengthy brewing process. And the research and design process is fun. Oh, and I’m going to start brewing 10 gallon batches. I’m now set up to do so and look forward to having doubly productive brew days. Published on December 17, 2008 in Beer Culture, Homebrew and Site News. 10 Comments Tags: december, fermentation friday, Homebrew. I’m pinch hitting for this month’s Fermentation Friday. It’s time to start thinking about the new year, and I’d like to take the opportunity to reflect on starting a new beer. Specifically, the yeast. 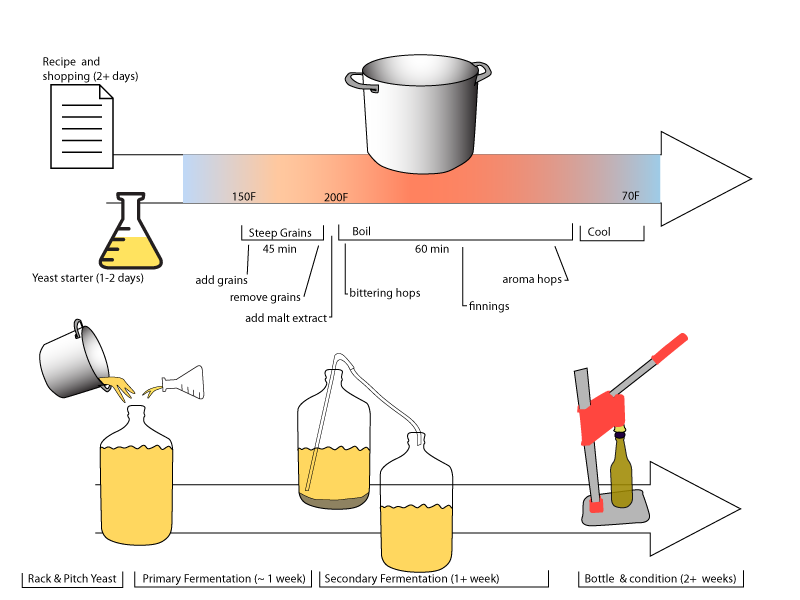 There are dozens of ways to inoculate your beer, and I’m sure everyone has some story behind their method. Are you a smack-packer, a pitchable vial user, a dry yeast re-hydrator, or do you let nature take it’s course? Do you make a starter, or do you pitch from the package? Do you cultivate your own strain of yeast that you salvaged from some special bottle smuggled from some distant land? Is there any dogma attached to your methods, or do you go where the wind carries you? Please share by the last Friday of the month, December 26th. Don’t let November happen to you – post early and post often! Published on October 30, 2008 in Beer Culture and Homebrew. 1 Comment Tags: fermentation friday. It’s time for y’all to whip out your best homebrewing horror stories. Extra points for tales of woe told in true campfire fashion, and head straight to the front of the class for a bonus handful of candy corn if there’s a deliciously ironic twist in the end. Well, gather ’round because I have one of the most frightening, lurid tales. Deep in the dark basement is where I store my homebrewing equipment, right next to the crawl space. In fact, there are some small holes in the partition between the safe part of the basement, and the dark, dusty, and recently-radon infested crawl space. One night recently, I wandered down in the dark to check on the laundry when I noticed a dulled sheen on my brew kettle nestled beneath the open stairs. Normally it sparkles in its stainless glory. Something was wrong. I stepped closer, straddling the pile of towels and linens waiting to wash, and was mortified to discover the cause. A layer of dust and dog hair had settled on top of my equipment, all of it. The equipment hadn’t been used for so long that had not only it developed a cake of dust, but it had started growing hair. Then, I traced a finger over the lid, hoping to soothe it, and was relieved to find that the dust and hair came up on the tip of my finger. This wasn’t permanent at all, just a dusting of neglect, a sin I could redeem myself of.